Schaudt Elektroblock EBL and other Charger repairs at £130 incl. + shipping. "I would like to thank you once again for the excellent and prompt service you gave to me when I travelled to North Wales. The repairs to the Schaudt Elektroblock EBL 271 Charger unit certainly saved my holiday to Spain, the Ferry had already been booked for that weekend. I just wish that all companies were as friendly and efficient as yours. Which are the cheapest Motorhome/Caravan Leisure Batteries? Take two batteries, one a big name high technology battery and the other a budget with conventional technology. The Big name battery costs £105 yet has 3 times longer life than the £99 'Budget' battery, so you can see which is the more cost effective. But if I also demonstrated how the big name battery not only lasted more than 3 times longer, but also, charged twice as fast, didn't self discharge, didn't gas or lose any fluid, was more efficient on Solar, delivered 70% better electrical flow, etc. you can see how different batteries have become, for not very much difference in cost? Technology has advanced the best Batteries so much, that for similar cost one high technology battery can be more than 3 times better than the next old fashioned construction battery, without paying anything other than 'Budget' battery prices. Alpha Batteries is a Battery retailer that has created a really good website that provides more information than any other allowing you to do your own Battery comparisons. Unlike other sites, they list cycle life and ideal charging voltages, etc. One typical battery that is a good example of how very different two batteries in the same price bracket can be, is this : Platinum LB6110l It is rated at a very poor 70 cycles yet costs £99. With the big manufacturers investing in high technology batteries, that can also be cheaper to produce than the old fashioned 'conventional's', it just doesn't make sense to buy anything other than a quality big name battery. It is time to stop thinking that all wet acid batteries are the same. We started this page about 7 years ago with the intention of trying to highlight that the 'Budgets' were not the low cost option they seem. Especially when they can cause charger and alternator destruction when they fail. Almost all the Motorhome and Caravan mains Charger failures we saw were down to poor batteries, an overlarge battery bank or both. So we began looking for a battery that wasn't expensive, had decent lifetime and was also kind to chargers. The Varta LFD90/Bosch L5 range with Powerframe technology became our 'Best Budget Buy' recommendation back in 2013 and since then it's reputation has become legendary. So much has happened since then, but particularly so in the last 12 months. During the last few years the Leisure battery industry lost it's way by diverging off into over marketed, short life AGM's, leaving the Powerframe Bosch L5/Varta LFD 90 to have the up to £150 sector to itself. With the industries realisation 12 months ago that AGM's were not delivering the promised life time when used as motorhome Leisure batteries, there was a massive flurry of activity that is leading to a whole string of exceptional Leisure batteries set to enter the market in Spring 2019. These new batteries use Enhanced Flooded Battery (EFB) technology, it is the technology of the moment, replacing AGM batteries in many of the big name car manufacturers vehicles like Audi, BMW, VW, Mercedes, Seat, etc. Even Land Rover are searching for alternatives to poor performing AGM's. These new advances and investment by the big manufacturers means the 'Best Budget Buy' Varta LFD/Bosch L range is getting really serious competition. While still an outstanding battery in almost every way it's no longer the only choice in that price range. For example, the Yuasa L36-EFB was part of a 'secret' group test, that we saw the results of, that made the outstanding Varta LFD/Bosch L series batteries look the poor relation, the L36-EFB was that good. PLEASE NOTE : The YUASA L36-100 is no where near as capable as the L36-EFB. The technology of the moment is Enhanced Flooded Batteries, the '100' version is a conventional battery. Thanks to the high Carbon, etc. technology inside the Yuasa L36-EFB battery it is also higher capacity, 100Ah versus the Varta LFD's 90Ah. Yuasa claim a charging rate that is 1.7 times faster, which proves this has some major efficiency improvements over an old fashioned, conventional battery range. We already have the Yuasa L36-EFB test data results to BS EN 50342, so it has laboratory data to back up it's 230 cycle capability, even though Yuasa understate it's capability at just 200 cycles. While it's resting voltage isn't as high as the Varta LFD90's 12.97v, it is still higher than a conventional batteries at about 12.8v, with a 50% discharged SOC of about 12.3v. So it falls about half way between the VRLA column and the Yuasa YX Micron column in the battery SOC chart. The Yuasa L36-EFB at around £120 is our new Mid Range Best Buy. While gassing is exceptionally low for this type of wet Acid battery, almost to Gel standards, Yuasa say a vent pipe to the outside is advised. If you need a battery that is safe inside the vehicle without a vent, then we think the Varta LFD90 is the only option, safer even than Gel or AGM. We need to find out more about all these new EFB batteries coming on to the market in 2019, until then please bear the above in mind when you read the page below, as it will take me a long time to rewrite the whole page. Most of the technology comments below also apply to the Yuasa EFB which has achieved 230 cycles in testing versus the Bosch L series and Varta LFD's 200 cycles. So you can see the Yuasa EFB is special, but when you also consider it is a 100Ah battery, that raises it above the Varta LFD90's 90Ah as well. The soon to launch Exide EFB Leisure range and Banner Batteries EFB offerings are apparently due Summer 2019 Launch. Expect these batteries to all perform way above what we have seen before for only slightly more cost. So what is a good battery that is also cost effective? We are Battery Charger repairers, repairing them on the workbench and inside motorhomes. So we get to see the electrical infrastructure where the damage to the mains battery charger or Alternator occurred. We have also cut open hundreds of Leisure batteries to see which work well, those that are poorly constructed, those with very short lives and those that are just bad. We no longer rebuild Alternators but have repaired hundreds in the past. That gives us more real world experience of Battery Chargers and Batteries than anyone we know. There is one battery range that uses advanced technology, that is so good it is Patented so can't be copied, yet the adoption of that technology has resulted in 20% lower production costs that are being passed onto the customer. This battery performs better than almost anything else in it's class, yet because of the lower production costs is little more than the cheapest budgets. It uses a series of technical innovations under the heading of 'Powerframe', yet can be used on any standard Motorhome/Caravan mains charger, Solar Regulator or Alternator. Johnson Controls build two identical battery ranges on the same production line, one labelled as Varta LFD and the other built for Bosch : the Bosch L series. The Bosch L version sometimes has a better guarantee and different marketing, but it's specification is identical to the Varta LFD. The Bosch L series and the Varta LFD range are our 'Best Budget Buy' batteries. They have unique technology inside that results in higher performance than almost all other Lead Acid batteries : longer life, greater real power, more efficient with faster charging times. They can charge up to twice as fast as conventional batteries and they don't self discharge or vent ANY Gas or fluid. These are safer inside the habitation area than a Gel or AGM battery. So why is a Varta LFD90 and the Bosch L5 so special? A conventional battery starts to corrode internally from the moment it is used, as in the photo on the left above. Corrosion, some times called Grid Growth, acts as a barrier to current flow. Plate Corrosion also causes 'Paste shedding' which can result in a battery Self Discharging faster than normal. You can see from the photo on the Right, that Powerframe technology reduces this Corrosion to zero levels, which also means zero fluid loss. It endows the battery with higher efficiency than anything in it's class, Bosch/Varta claim up to 70% better electrical flow as the batteries age. Bosch claims very high charge acceptance - it is one of the fastest charging wet batteries around on conventional Alternators and mains chargers, yet because of it's efficiency, it places an overall lighter load on the charger than any other battery. In the average Motorhome, it charges even faster than an AGM battery, yet the Varta/Bosch Powerframe doesn't suffer the AGM's charger intolerance, temperature issues and resultant short life. The absence of Corrosion/Grid Growth also means that the normal loss of adhesion by the Lead Paste is reduced, so there is less 'Paste shedding' which is the primary cause of shorted plates and rapid self discharge. Therefore the battery AH Capacity does not deteriorate to the extent other batteries do, performing closer to maximum Ah capacity for longer, right up to end of life from exhaustion of the Paste/Active material. The Powerframe high Silver content further adds to battery efficiency at both High and Low temperatures. The Bosch L5 Deep Cycle battery will start a big truck engine in freezing conditions and last longer and perform better than most batteries in hot Desert temperatures. This technology also has very low self discharge rates. Put a perfect Varta/Bosch in the Shed in October and it will still be near to 'full charge' in March. Although an interim 3 month charge is recommended. So How Does It Manage To Be So Good? The special Silver Alloy Grid is manufactured using a rolling and stamping process, which changes the molecular structure of the metal resulting in it becoming highly corrosion resistant. This combination of the Silver Alloy (Silver is a very efficient electrical conductor with exceptional anti-corrosion properties) and the Rolling process makes a huge difference to the way it behaves. There are several other clever manufacturing touches, but the Powerframe Silver Alloy Grid is the key. This resistance to corrosion not only improves battery efficiency, but when corrosion is the primary cause of Wet Acid battery failure, battery life is also dramatically improved over a conventional battery. See the chart below from a battery Lifetime study of thousands of batteries showing that 86% of Wet Acid batteries go 'End of Life' from Grid Corrosion as the primary cause of failure. 2. That 33% of AGM and Gel batteries died from 'drying out'. Remember hearing the myth that Gel and AGM's never lose fluid by gassing? If you read the manufacturers information, they all state that AGM batteries lose fluid, but the loss is usually fairly low. It is the battery retailers that make statements the fluid loss is 'Zero'. Together 'Dry Out' and Corrosion accounted for the premature destruction of 92% of all AGM/Gel batteries. That is 92% of ALL AGM/Gel batteries never reached their claimed cycle life because of premature failure from corrosion or loss of fluid. Powerframe technology address's the primary forms of battery failure, like Corrosion, Fluid Loss, etc resulting in these special batteries being unique in lasting right to the end of the very last cycle, along with 70% better efficiency that lasts right to End Of Life. Because Corrosion and fluid loss normally go hand in hand, if you block the process of corrosion inside the battery, it won't gas off fluid. If you then additionally create a special top that causes the slightest amount of fluid to condense back into the battery, you can see why they claim 100% maintenance free. The graphic below from the Bosch website shows the 'Special Lid Structure' that prevents fluid loss outside the battery, making it 100% gassing free. "...Labyrinth construction ensures that evaporated liquid remains in the battery. This makes the battery 100% maintenance free, as well as leak-proof and tilt-proof. The Central ventilation opening (as in linking the cells, not as in 'to the atmosphere' ) means it is suitable for installation inside the passenger compartment". The above Bosch web page twice states "100% Maintenance Free" and "evaporated liquid remains in the battery". Despite all the above some people still compare Powerframe batteries it to a conventional Wet battery when they really are not the same. Even battery retailer sales teams rarely have a clue how special this battery technology is. This battery is safer to use inside the habitation area of a Motorhome/Caravan than even a Gel battery. "Labyrinth lid : returns condensed water to the battery". Our Summary of the benefits of a Varta/Bosch Powerframe as a Motorhome battery. Low self discharge : Stays highly charged up for 6 months +. Varta claim a 12 month shelf life. High efficiency : Up to 70% better current flow over a similar age older battery. Very Low internal corrosion : This makes it more efficient than the opposition, especially after 2 years +. Long life and strong performance right to End Of Life. Maintenance free : Zero fluid loss (so as safe inside the MH as Gel/AGM battery, see evidence below), actually safer, as the LFD is less likely to explode than either Gel or AGM. Faster charge up : Upto twice that of a budget 110Ah battery. See more below on "110Ah Budget batteries". Lightest load on a charger of any battery technology : Significant from our point of view, they place a lighter load on the battery charging systems, both Mains 230v and the Alternator. This real world independent test In extreme desert temperatures shows a Powerframe lasted 94,000 miles versus 41,000 miles. A ratio greater than 2 to 1. In other words, at an annual mileage of 10k, a Varta Powerframe starter battery used in the hottest, most extreme conditions, lasts 9.5 years versus just 4 years for a conventional battery. We think, strong evidence that the Varta LFD90/Bosch L5 will not only out last a conventional wet habitation battery by a big margin, but do so when used in heat of Southern Spain. The Varta LFD/Bosch L range is our "Best Budget Buy". Guide price £105 for 90Ah from Alpha Batteries. The Yuasa L36-EFB is our "Best Mid range" battery. Guide price £119 for 100Ah from Alpha Batteries. The Exide ET650 is our "Best Buy Heavy Duty" battery, but costs about £140 from Alpha Batteries. The Exide ES900 is our "Best Buy Deep Cycling" battery. Guide price £180 from Alpha Batteries. 2. They can take twice as long to charge up which can be self defeating as any battery taking longer to charge may only be up to 'Half charge' from any charger Alternator/Mains/Solar/etc. by the time it is next required. So while they can be ultra Deep discharged to 80% DOD, if they then only slowly charge back up to 40% DOD, that will be all you will be able to draw on the next discharge, about 30Ah. A Yuasa L36-EFB will probably be back to full charge in the same time frame, therefore able to release 50Ah before it hits 50% DOD. The Yuasa has more 'usable' energy because it maximises every milliamp from Solar, Alternator, etc. 3. Gel's also need a special charge profile for Solar and mains chargers. 4. Gel batteries won't reach anywhere near their expected life if operated at higher temperatures (above 20 degrees) or at higher discharge current which will also raise the temperature. Literally half the life can be lost if the Plate temperature rises by 10 degrees. A 20 degree rise will cut life by 75%. when most people use their batteries on hot days in hot climes, you can see it may deliver less than 25% of it's potential. 5. Gel's will be a very poor match when paired with the high heat, high current draw some Inverters might impose. Because the acid in a Gel battery is literally a Gel, it's mobility is severely restricted, as is heat transfer. So when you start drawing high currents, the chemical reaction at the Plates exhausts the Gel acid closest to the Plate and cool, fresh acid is slow to replace the exhausted, hot acid. As a result the power able to be produced drops off rapidly, sometimes so far an Inverter might shutdown through low voltage/current. That is why Starter batteries don't use Gel technology. If you holiday in Iceland, don't use high power equipment and don't need many amps per day, then Gel would give good service. We think Gel batteries are too compromised for modern motorhome use, but where a special Deep Discharge need is required, little can beat Gel. In our opinion, the Victron Super Gels will exceed Lithiums in performance in real world operation in a Motorhome for the same outlay. Because the LFD90 and L36-EFB are also designed to start an Engine, they cope well with a short duration high current draw so are better suited for powering a Motor Mover on a Caravan more than almost any other battery. However, even an LFD90/Yuasa AND the Mover Electric Motors, should be rested for 30 seconds for every 5 minutes of use of a powerful Motor Mover setup. Please do not use an AGM or Gel battery with a heavy Motor mover equipped Caravan. A four wheel drive mover going up a slope or on a tight turn uses huge amounts of power for several minutes which will overheat an AGM/Gel with resultant shorter life. It is also very important not to charge up a battery that is already warm from exertion/power drain, let it cool for at least 60 minutes first before turning on the charger when you first hook-up if the Battery has been working hard powering a Mover. This company below sells the Varta LFD90, it isn't a huge business so has limited stock space so you can be sure the battery has not lost half it's life from sitting on the shelf for months. They can deliver to your door and because the Varta LFD 90 is so well sealed it travels better than most wet batteries. If you mention us they may give you a small discount, at Alpha Batteries discretion. If you are ordering two batteries they guarantee to give you matched pairs from the same batch. How can the Varta LFD90/Bosch L5 wet batteries be safer inside the Motorhome than a Gel battery? 1. The special Powerframe technology reduces bubbling to zero levels. 2. Should Bubbling occur under exceptional circumstances, the fluid condenses back to Water. 3. Gel and AGM batteries operate under pressure, the safety valve can, and does, open to vent gas. 4. See the section near the bottom of the page on Battery Explosions and Thermal Runaway. AGM batteries used in the Motorhome environment where an AGM optimised charger is rarely available, have a higher premature failure rate and a higher risk of explosion. See top of the "Long Term EHU" webpage for the email from Sarah if you think that is rare. Note that Gel, like all VRLA batteries, can have a higher 'resting', or 'State Of Charge' voltage which affects the 'guide' discharge voltage. 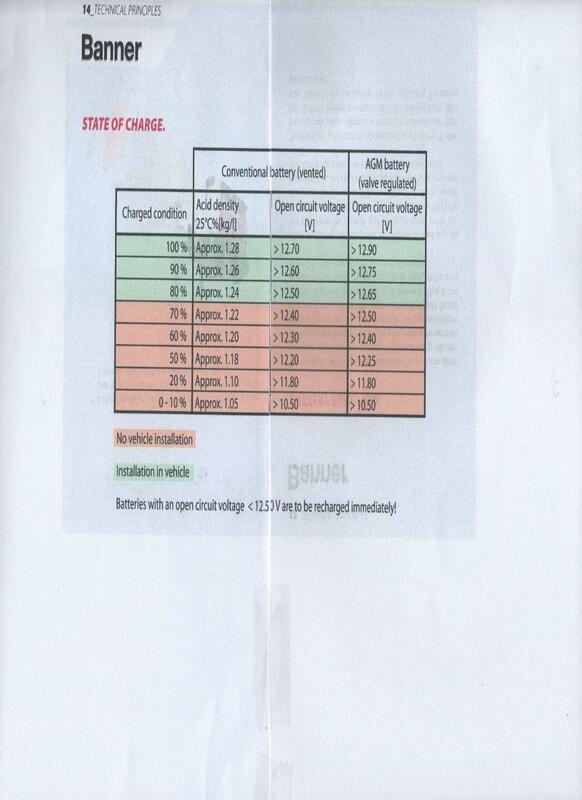 If you look at the chart below from Yuasa Batteries, a VRLA/Gel battery is 50% discharged at 12.5v, whereas a conventional battery is 50% discharged at 12.1v. We suggest you use the Sealed VRLA column above as a guide to the discharge level for a Varta LFD/Bosch L5 battery as they have a resting voltage nearer to that of Sealed/VRLA and their characteristics are more on par with a VRLA than a 'conventional' battery. The photo above shows a new Varta LFD90 at close to 13v after being fully charged and left to 'rest' for a week or two. You will find many different charts around, but most seem to be based on redundant technology Antimony based batteries, which fell out of favour in the eighties. A battery 'State of Charge' chart that doesn't recognise that different technology batteries have different voltages, is clearly not to be relied on. When 50% discharged the Varta has almost the same voltage as a fully charged conventional Lead Antimony battery!! That is useful higher 'voltage' when it comes to Diesel heating, which can draw so much start-up current it can cause significant voltage drop. Likewise some TV's that require a minimum voltage, may run better on a Varta/Bosch Powerframe. Remember this is a chart of quality batteries, don't expect a conventional Platinum Battery to perform anywhere near as well as a Yuasa Conventional battery. That is all very well, but a 90Ah battery is too small for me, I like 110Ah batteries? When we were cutting open batteries in 2012 - 2013, the budget 110Ah batteries all showed poor quality construction and significant signs of failure. We have not yet tested a budget 110Ah battery in the L5 package (same physical size as LFD90/L36-EFB) that had even 95Ah capacity, despite the label stating 110Ah.. In July 2018 one big Battery Wholesaler took the very major, and in our view honourable, step of down grading the label capacity of all their budget batteries by 5 to 10Ah. The 110Ah, although exactly the same as before, now had a label stating a lower 100Ah, which it clearly has been all along. It has been known for some time that battery capability at the lower end of the market has been exaggerated. Hopefully now that the governmnet DBEIS team are in the process of targeting such batteries with full testing, the manufacturers and wholesalers will be more honest. We don't sell any batteries, this is as independent as it gets. We would advise caution in regard to buying Lead Crystal batteries as the technology inhibits the heat transfer that develops whenever any battery is used. Therefore it's use may be severely limited by this restriction to an even greater degree than the poor temperature performance of Gel or AGM when used in motorhomes. It is now universally accepted that AGM won't deliver the capability suggested by laboratory tests, often failing in miserably short times. As these Lead crystal batteries have AGM based cell technology, with even tighter than usual temperature working tolerances, they are likely to be even poorer performing in real world motorhome use. a white crystalline powder when charged/discharged"
"Our patented Lead Crystal® Batteries have different charge characteristics compared to conventional lead based batteries and therefore need suitable chargers to function optimally. The Lead Crystal chargers are embedded with optimized micro-processor controlled charging algorithms that ensure correct charging of all Lead Crystal® Batteries". Note that failure to use of one of their special chargers will almost certainly invalidate the Warranty, see the second paragraph in the Warranty extract in Red letters below, plus cause the battery to under perform. How you would integrate one of these chargers with something like a Sargent EC325, EC328, etc. and still have the charging information displayed on the LCD unit above the door would be a complex puzzle for someone. As it would be for most Power Controllers where the charger is integrated into the entire Power control/Distribution unit. "Betta Batteries will replace a battery if, when used within its parameters, the available capacity falls to a level lower than 40% in 10 hours under no load within 18 months, or if the capacity falls lower than 30% in 10h under no load within 19 to 36 months. The guarantee will be null and void in the event the battery is installed incorrectly, misused, used or (dis)charged outside specifications, damaged by external influences". In other words the battery has got to be so bad that the warranty will only be valid if the battery leaks 40% of it's capacity in just 10 hours when standing unconnected to any wires!! A self discharge of 40% of capacity in 10 hours is a battery that actually became unusable months before. The warranty stipulates the battery must be used 'within it's parameters', but I can't find anywhere where those parameters are printed. To me that is a warranty from a company that expects lots of premature failures so has designed a warranty where no one can make a claim. Add in the ridiculously short warranty period for a supposedly long life product, plus the stipulation of a specialist charger to keep the warranty active and that suggests to me this is a battery to avoid at all costs. Not a confidence boosting start when considering a very expensive £450 for a 100Ah battery? The smaller Varta LFD75 is 278mm long, 175mm wide, 175mm high. 12V, capacity 75Ah, cold test current 650A (sometimes called cranking amps). Note that the Exide ES900 and the older G80 Gel batteries are 353 x 175 x 190 (incl. terminals) so a match for a 90Ah Varta LFD90 (information courtesy of David Chambers). Note 2 : The Varta LFD 90, Bosch L5 and Yuasa L36-EFB make a better Starter batteries than almost any other battery when used in a Motorhome. Motorohome Starter batteries tend to discharge lower when idle for weeks at a time than most Starter batteries are designed for. A load the Varta LFD 90, etc is designed for and they are usually more powerful than many dedicated Starter batteries, especially during the freezing conditions of mid Winter. The size matches most Fiat, Renaults, Mercs made after 1999, direct swap for the OEM Starter battery. The LFD 75 Silver is a perfect replacement for Ford Transit Silver starter batteries. More powerful than the originals at half the cost of a Ford OEM battery. A cautionary warning about "Industry 'Battery testers" as they can be quite misleading in relation to a Motorhomes true battery condition. Bear in mind that while we probably know more about batteries than many, battery tester units are not our speciality as we don't think there is a better battery test than carrying out your own, see bottom of page for details. However we will try and give a run down on what we know of the battery testing tools, their strengths and weaknesses, in laymans terms. Perfectly happy to be corrected by those specialists in this area. There are three common test units. The first is the old fashioned 'Drop Tester' which places a huge load on the battery to see how it handles that load. They are designed to see if a battery can supply enough current to start a car engine. Obviously of absolutely no relevance to a habitation battery. These are becoming less common as they can stress the battery, sometimes resulting in a damaged battery that was previously good, especially a leisure battery. The second type of tester is a small electronic device that attempts to 'guess' the batteries state by checking it's resistance and voltage then making an assessment based on what it finds. The technology is more complex than this simplified explanation. The third, and more expensive type, places a small load on the battery (not as stressful as the old Drop Tester) and monitors what power the battery actually delivers plus other parameters. They usually also use this data in association with a battery resistance/voltage check. These are very expensive so less common. The problem with the old fashioned car battery Drop tester is the stress it places the battery under. They were designed for Starter batteries so assumes the battery is from a Car/truck and so designed to deliver the big currents drawn by a Starter Motor for Starting an Engine. Clearly a Motorhome Leisure/Habitation area battery isn't designed to do that, they deliver small current over long periods of time so a demand for a large current might not do a Leisure battery any good. It may pass the test but have suffered internal damage that will only show up later.. Suggest you never let anyone 'Drop Test' a pure leisure battery, especially if it is less than 100AH and/or Gel based. The second type of tester measures battery voltage and resistance. The resistance varies with the state of charge, not just internal degradation, which can skew the results. While they sometimes use the voltage to ascertain a batteries state of charge, some are unable to cater for the different voltage ranges of the different battery technologies. The resistance may also vary with different forms of degradation, such as Internal corrosion, plates partially shorting, etc. So while the resistance may indicate an issue, the device can only guess at what that issue might be. Further to that, one issue may reduce the resistance, like Antimony poisoning, while Internal Corrosion may increase it balancing each other out and showing a 'healthy' battery when it isn't. Batteries degrade for a number of reasons and it is possible to fully charge a battery that then delivers enough power to start a Fiat 3.0, but will slowly lose charge over days. So while the Starter battery might get a 'Pass' of 550 out of 650 'cranking amps' when tested straight after a recharge, it may be down to half that after just a week. Such a battery is no use to many motorhomes that stand idle for long periods, but be perfectly adequate for a Car/Van that is used every day. Conversely a battery could be down to 70% of it's rated capacity yet hold it's charge for months. The third type of battery tester that adds a 'small 'load' just prior to the resistance check, can be more accurate, but not infallible when used on Motorhome/Caravan batteries..
All the test units check primarily for the 'instant' power a car/Van/truck Starter battery can deliver, as this is the most important factor for the vast majority of vehicles that are used every day. But a Motorhome Starter battery can be used very differently, A Motorhome Starter battery can stand unused for many weeks where it's ability to hold capacity, is a more important factor. Not one of these testers are able to report on the actual Self Discharge rate. In my opinion, you can't beat your own test of fully charging a battery, leaving it for 2 weeks (to test it's ability to hold a charge), then placing a known small load, about 4 amps, to see what it's capacity is (to test how many Ah it can deliver). However, it is VERY important not to discharge the battery in the test below 50% Depth Of Discharge (DOD) and the voltage you need as guidance will vary according to the batteries Technology. A conventional battery will be 50% discharged at about 12.1v, a Gel battery at 12.5v and a Lead Acid Powerframe battery, like the Bosch L5/Varta LFD90, very close to the Gel voltage range. You can see from the chart that discharging a quality technology battery down to a conventional batteries 12.1v will discharge it more than ideal, so likely to seriously shorten it's life or even destroy it totally. 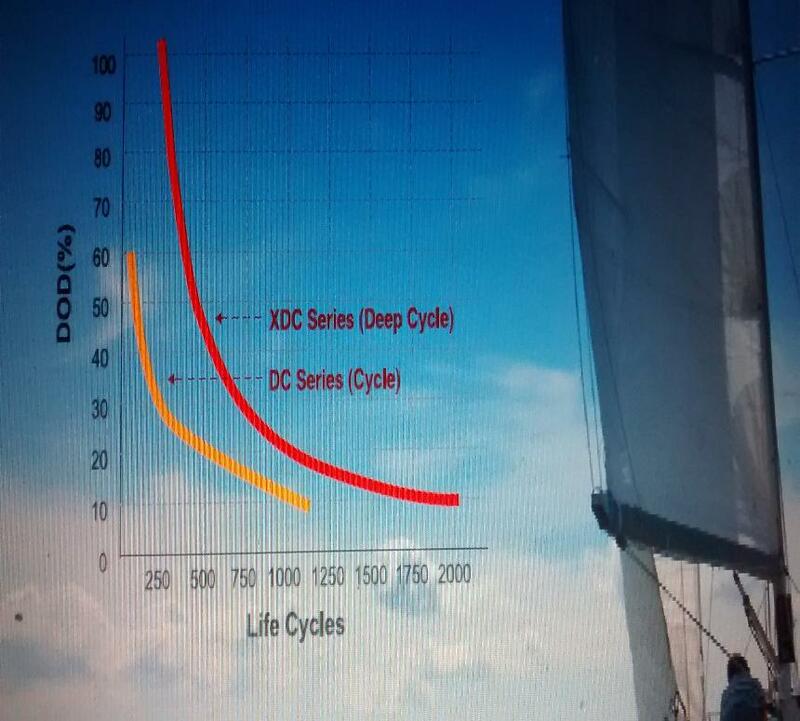 In the graph below, you can see that something like the Hankook DC27 depicted by the Yellow line will give just 3 cycles if discharged below 80% DOD, so use 50% DOD as your absolute test minimum.